A short documentary about me was produced by Olive Tree Pictures. I was interviewed by Greg Thomas of TSC along with playwright/director David Ham and co-director, Marco Santiago about my co-directing The Cross and the Switchblade. The discussion centers around the production and gives valuable insights into using one's artistic and creative gifts for the Lord. Click here to listen to the podcast. My Mom went home to the Lord Dec. 28th after battling pulmonary fibrosis for some time. She had expressed her desire not to die at Christmas because she did not want her children burdened with that remembrance every year when we should be focused on the joy of our Savior's birth. Although a practicing Catholic for most of her life, she understood in the last years that Jesus was her Savior and she accepted Him. The Lord heard her prayer and after a joyful Christmas with many family, friends and extended family dropping by her bedside...she would ask, "Is Christmas over?" the next day: "What's today's date?" and finally on Dec. 28th she was ready to leave. She had been expressing how she was ready to go home to Jesus and she did not fear. She thanked God for a wonderful life, family and children and said she was not angry for her ailment...saying, we must all die of something... Until the end, she was still offering to sew hems on her nurses pants, being a human GPS for everyone needing directions and re-telling family stories from the past, from her childhood years to funny recent events. She reminded us she had started to write her memoirs and left a note with her will for her 3 children. Her life was not perfect, but she touched many deeply. She was sent off with her former choir members singing gloriously at her home church...and I just know she is dancing, singing, designing and sewing new heavenly robes for the Lord's special angels and heavenly hosts!! 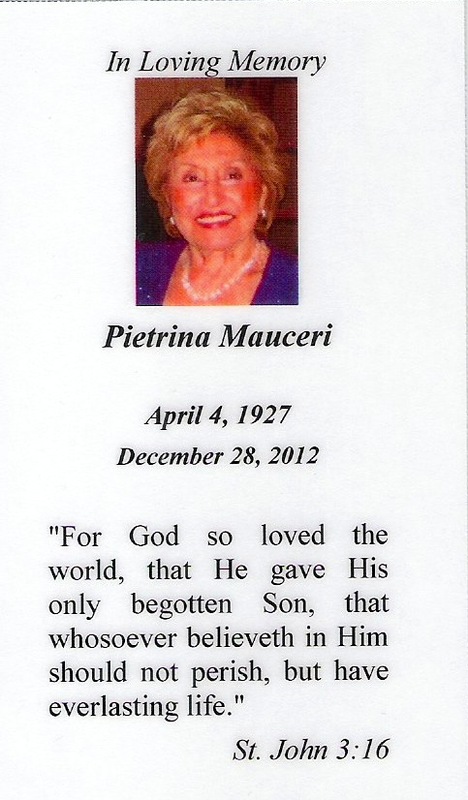 Farewell, dear Mother...now the Lord will help us to make our way...without you. On Sunday I performed "A Samaritan Woman" at our Westchester Chapel, just north of New York City (WestchesterChapel.org). I developed this a one-woman piece with international and Off-Broadway producer John Forbes and international performer Rich Swingle. Closing observations are by Pastor Randy Solomon. This service is available for download on iTunes, where you can also subscribe to our podcast. Search for "Westchester Chapel" on the iTunes Store.